A sold out crowd of 42,000 for a team averaging 20,000. Some 250 media credentials issued for the Nationals/ Pirates game, which normally has about 75 issued. And Bob Costas already putting Strasburg in the Hall Of Fame with the Walter Johnson comparisons. Let the insanity REALLY get underway. Time to put some perspective on tonight’s unreal performance by the latest baseball wunderkind. From the start of the game till he finished off his 94-pitch effort, the kid was in control. He racked up 14 strikeouts, one shy of the record for a pitcher in his first start, and threw 65 strikes with just 29 balls. 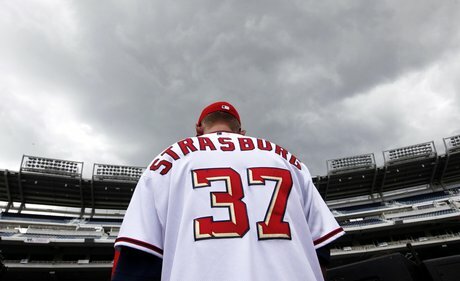 Strasburg did everything that Scott Boras said he could do when the agent was signing the insane contract for his client less than one year ago. And he handled it with class and respect, just the way every young pitcher should upon making their Major League debut. steps forward so far in 2010. But they may have taken their biggest step to date with the effort by the 22-year old. And it is a step that not only effects the Nationals, but also the rest of the N.L. East. Just think about how many starts he will get against the Phillies, Mets, Marlins and Braves over the rest of the season. I know, I know. It is just one start. But what a start it was.